A Riverview Wedding is one that will dazzle guests. The private event venue was built only a few years ago in 2008. 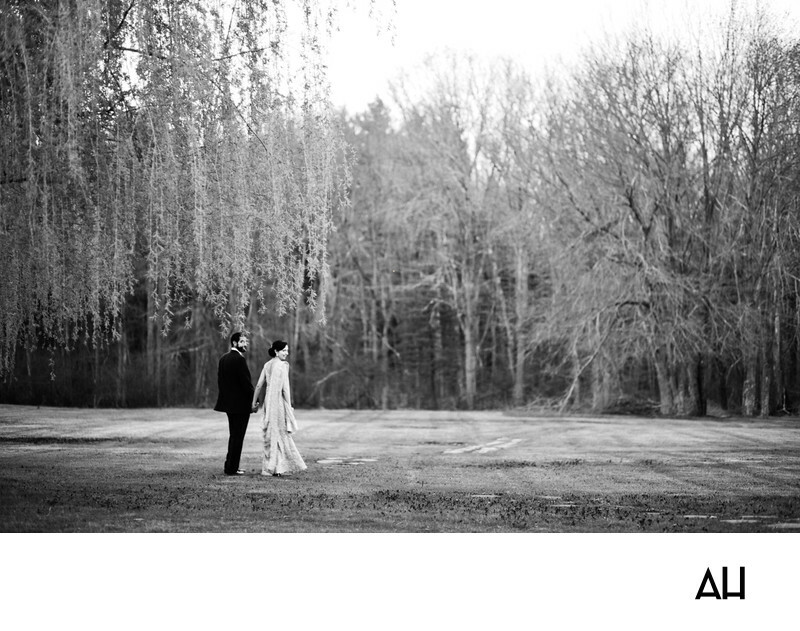 It is a location that allows couples to experience an elegant, glamorous reception, while surrounded by the beauty of rural Connecticut. Guests at a Riverview Wedding will be in awe of the buildings crystal chandeliers, cathedral ceilings, granite dance floor, and large windows that look out over the grounds. The grounds are immaculately landscaped, with an enchanting gazebo and waterfront views. The venue is set on the banks of the Farmington River and creates a lovely scene for any couple to celebrate their love. This photograph was taken at a late-fall wedding. The timeless black and white image shows the bride and groom walking into a clearing, taking time to enjoy one another’s company on their big day. The walk hand-in-hand, and gaze at the captivating scenery. Many of the trees before them stand bare as they prepare for winter, their branches reaching up to the sky. The couple takes in the view of the grounds, comfortable in their setting and with each other.